Grandpatch Farm | Come see our herd! GRANDPATCH FARM literally means Great Place and it is located near Kenney, Texas, off of highway 36 between Bellville and Brenham. Bellville, Texas is a quaint community popular with antique shoppers, located 7 miles south of Kenney. Brenham, Texas is the home of internationally famous “Blue Bell Ice Cream” located 9 miles north of Kenney. 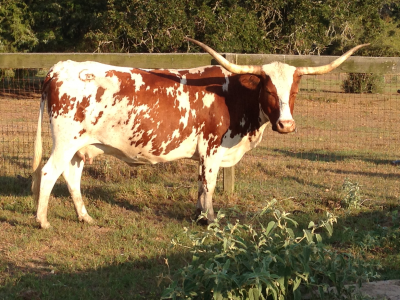 GRANDPATCH FARM is our 47-acre working ranch where we raise Texas Longhorn cattle. Meshach, the sire of the majority of our cows is perhaps the most famous longhorn bull and has sired many champions. We lost Mesach in March 2008. Our #1 bull is John 14:21 who is a very handsome bull out of a Matthew cow and Psalm 138:7. He won Reserve Grand Champion All Age Bull and has a great disposition.